Large Pitcher and Greek Vase in Copper Harbor. These two porcelain pieces are glazed in the Copper Harbor glaze. 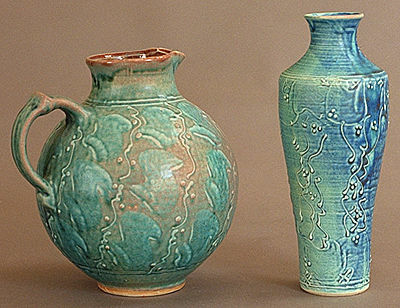 This glaze is variable from piece to piece and even from one side of a piece to the other. The source of the color is copper carbonate. This compound reacts to the slightest change of temperature or atmosphere in the kiln. So each pot is a permanent record of the variable firing conditions in different areas of the kiln. The Large Pitcher is 9" tall and holds about 4 qt., costs $70, and has a catalog number of P2. The Greek Vase is 9" to 10" tall, costs $70 and has a catalog number of V1. These pieces are available in al the other color selections. 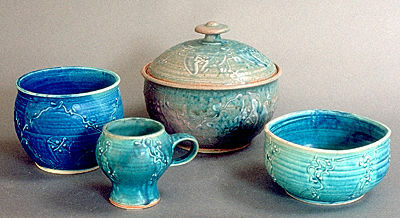 A collection of pieces in the Copper Harbor Glaze. From Left to right: Small Cache Pot, 7" wide, 6" tall, $34, (B2) ; Pedestal Mug, 10 oz. capacity, $18, (M3) ; Small Casserole, 9" wide 8" tall, 1" qt capacity, $60, (C2); Small Squared Bowl, 6" wide and 4" tall, $40, (B7). These pieces are available in all the other color selections.